Fair Friend Group (FFG) is a Taiwan based industrial conglomerate with over 90 companies operating in the fields of Machine Tool Technology, PCB, Industrial Equipment and Green Technology. FEELER is the overseas marketing brand for the machine tool division of FFG, which has 37 machine tool brands and 50 manufacturing bases located throughout the world. Its product portfolio includes vertical/horizontal turning and milling, 5-axis machining center, automatic production system and all line equipment. As a provider of turnkey production solutions, FEELER works with manufacturers to design and implement the optimal solutions for their production needs, often using advanced 3D manufacturing simulation software. They shared an example of a recent project they completed for the design of a Flexible Manufacturing System (FMS). 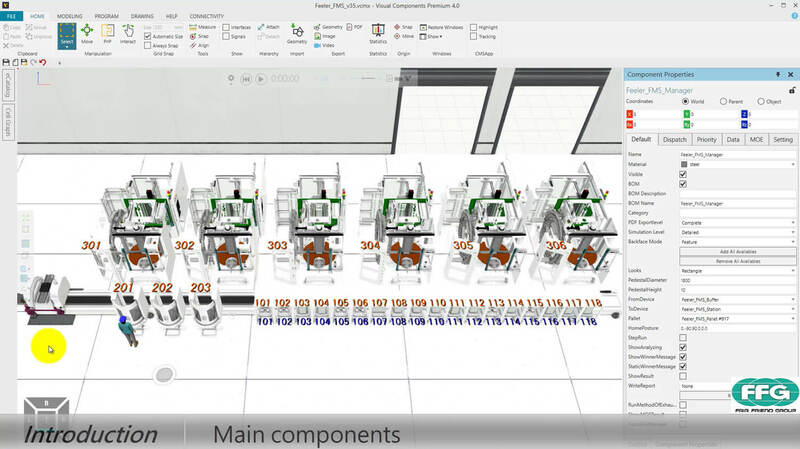 Using Visual Components 4.0, FEELER analyzed multiple layout configurations and production scenarios to determine 1) the optimal number of CNC machines, and 2) the transport priority for the Rail Guided Vehicle (RGV). Check out the video to see how they did it!